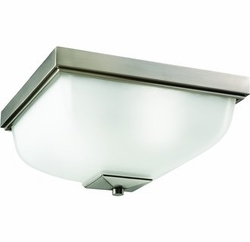 Kichler Lighting presents this flush mount fixture with a squared design of antique pewter and satin etched glass. You can use fluorescent bulbs to give it a better effect due to the cool white glass. Available in olde bronze . UL listed for damp locations. Bulb: 2 x 100W Max. - Diameter: 13" - Lamp height: 7"